‘NOT DEAD YET!,’ a storytelling celebration of personal triumph over darkness, is coming to Seattle’s South Lake Union area Saturday, June 13. Recovery Café is excited to be the beneficiary of this event. Tickets are just $20 and can be obtained at https://rallyup.com/not-dead-yet. Parking is free in two adjacent KING 5 lots at Dexter and Harrison, as well as on-street. We hope to see you there! Many of us have been there – leading active, successful lives and then suddenly hit with tough emotional times. Seven local professionals will share their inspiring stories of overcoming addiction, depression, anxiety, bipolar disorder, suicidal ideation and more. With laughs, personal stories, and maybe some tears, they demonstrate that we can lead fulfilling and successful lives despite facing mental health challenges. The event – led by The Stability Network — will be hosted by KING5 at its studios at 333 Dexter Ave. from 7 to 9 pm on Saturday, June 13. 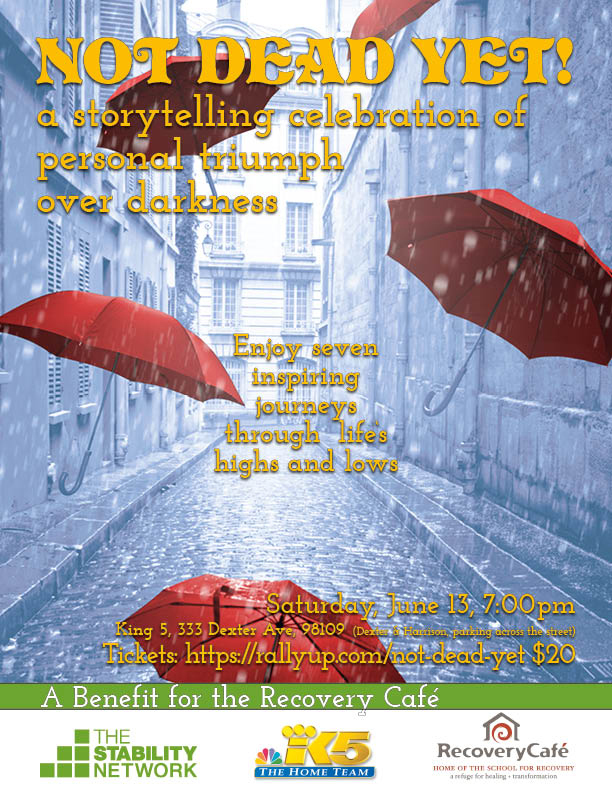 Proceeds from the ticketed event will go to Seattle’s Recovery Café, a support center which uses a therapeutic community model to address those very issues, and to break the cycle of homelessness. Bill B. has struggled with bipolar disorder, addiction and social anxiety. He is grateful today for a fruitful career, rewarding creative pursuits and rich connections with others. Veronica Borgonovi created a thriving personal community and successful consulting career while overcoming depression and anxiety. She is an Associate Director at non-profit FSG, a mission-driven consulting firm, and she loves exploring Seattle’s natural beauty. Susan Fox, 28 years in recovery for alcoholism, depression and anxiety disorder, is the Executive Director, Peace for the Streets by Kids from the Streets. She utilizes the voices and wisdom of homeless youth to create conditions leading to self-sufficiency. Jennie Shortridge lives with generalized anxiety disorder resulting from PTSD. She is an author and community leader who writes bestselling novels about the impact of mental health challenges in peoples’ lives. She is co-founder of Seattle7Writers.org, a nonprofit authors’ collective. Katherine Switz, a manic depressive with previous and serious psychotic episodes, is founder of The Stability Network, an exciting and brand new coalition of successful professionals speaking out about their mental health conditions. Katherine advises the Gates Foundation. Don’t miss this important event. Tickets are $20 and can be obtained at https://rallyup.com/not-dead-yet. Parking is free in two adjacent KING 5 lots at Dexter and Harrison, as well as on-street. For more information on The Stability Network go to www.thestabilitynetwork.org or call 206-448-3674.